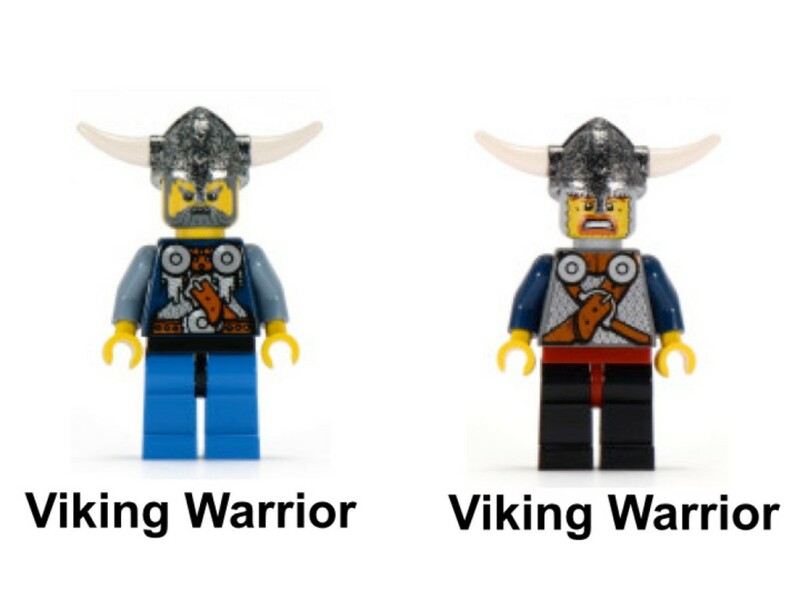 The Vikings LEGO theme was based on Norse Mythology and the ancient Scandinavian warriors associated with the legends. 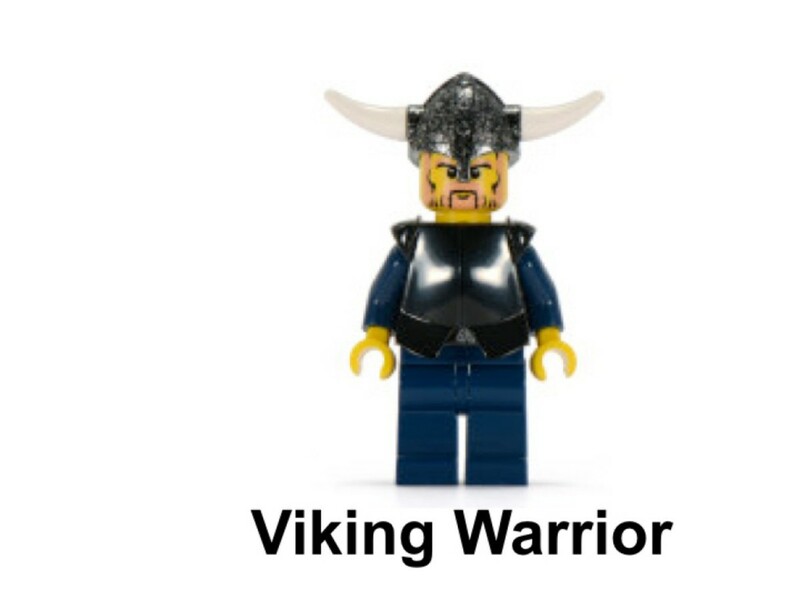 The stories revolve around a warrior or group of Vikings fighting a single monster. 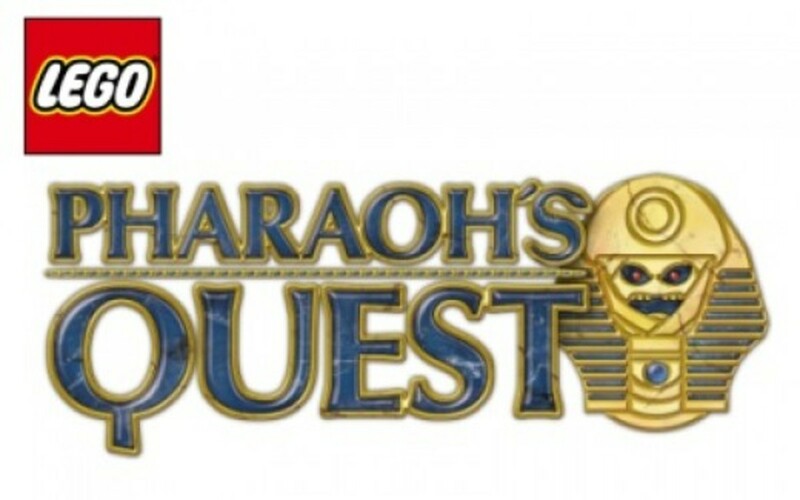 The theme was introduced in 2005 as a filler between the recently discontinued Knights' Kingdom II series and the planned 2007 release of the new Castle theme. However, the use of a culture based outside the traditional European history proved extremely successful and it remained on store shelves a year longer than originally planned. 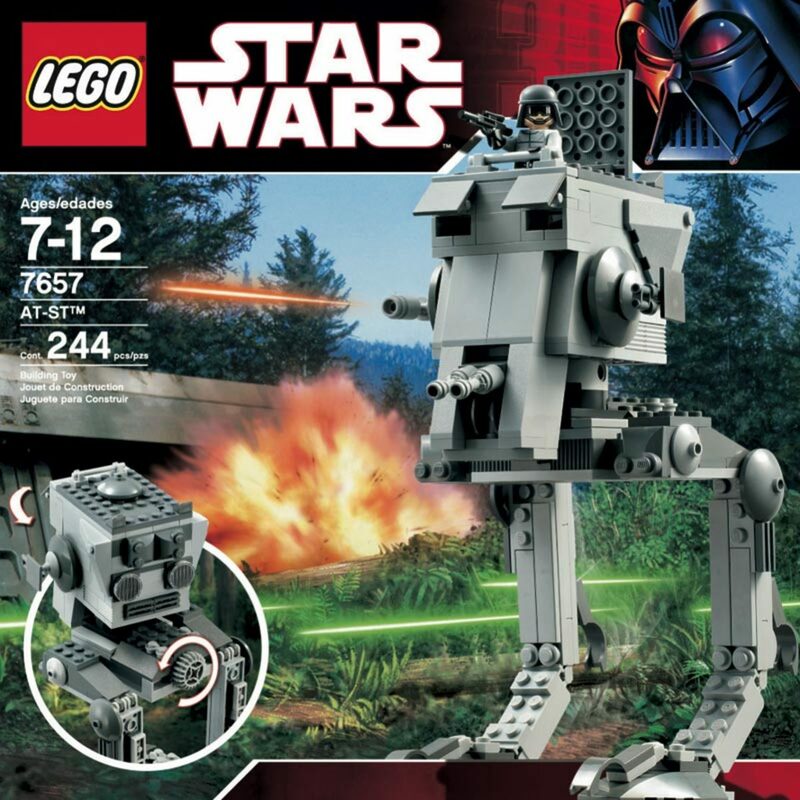 It was discontinued in 2007 and overlapped with the Castle line. 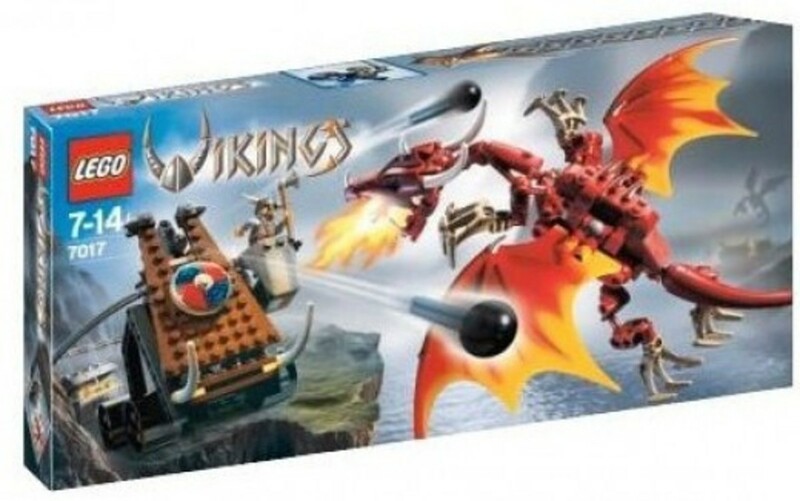 In fact, most of the Viking sets were later re-imagined to fit within the Castle series. 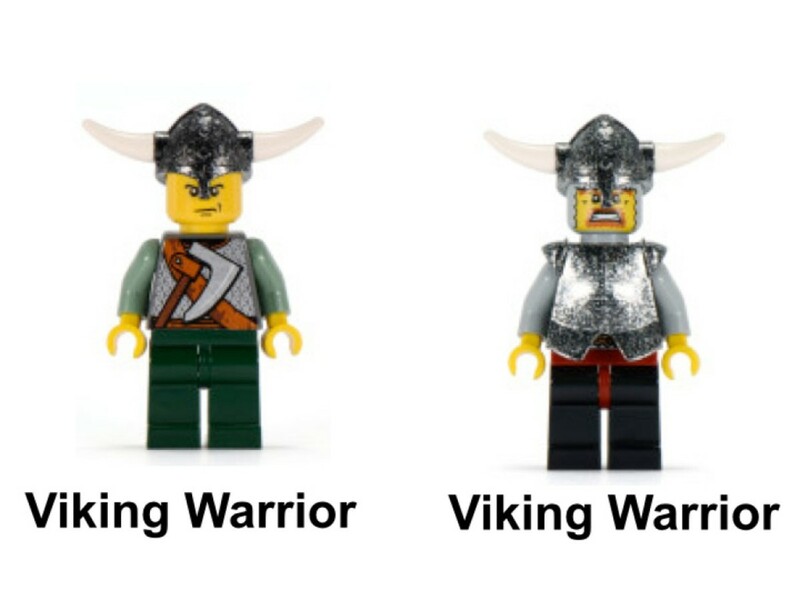 To create the iconic look of a Viking warrior, LEGO released the fabled horned helmets for the first time. 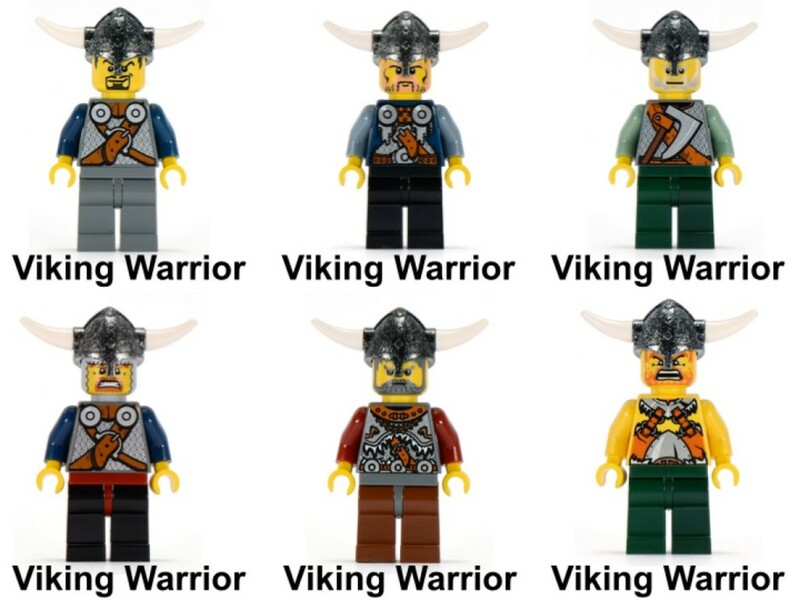 Many of the Viking minifigure faces were also first introduced in this theme. The other LEGO piece making its debut were the battle axe blades. 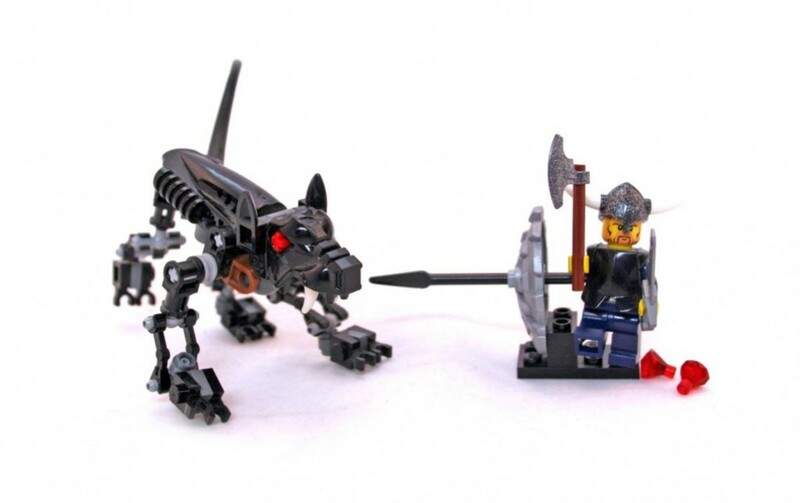 To help set the monsters apart from the human minifigures, the creatures were assembled in a BIONICLE style. 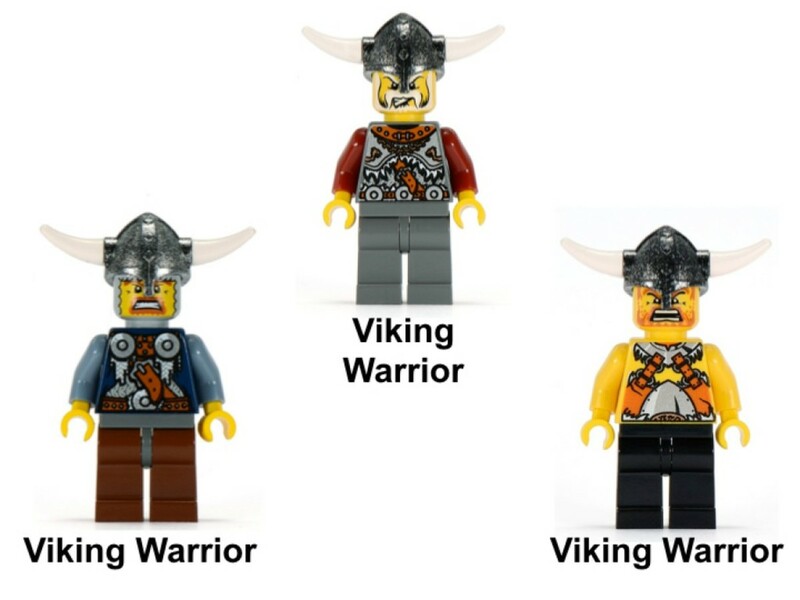 You may notice as you read about the individual sets, the Viking theme has the record for longest set names. 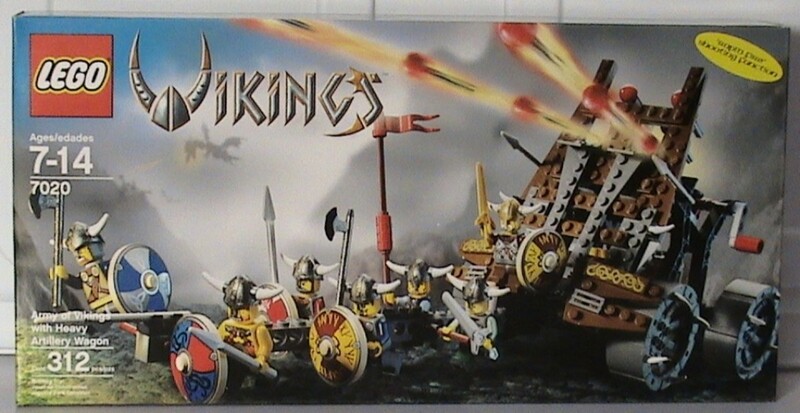 This is the only Viking building set to not include a monster, but does have the most minifigures. 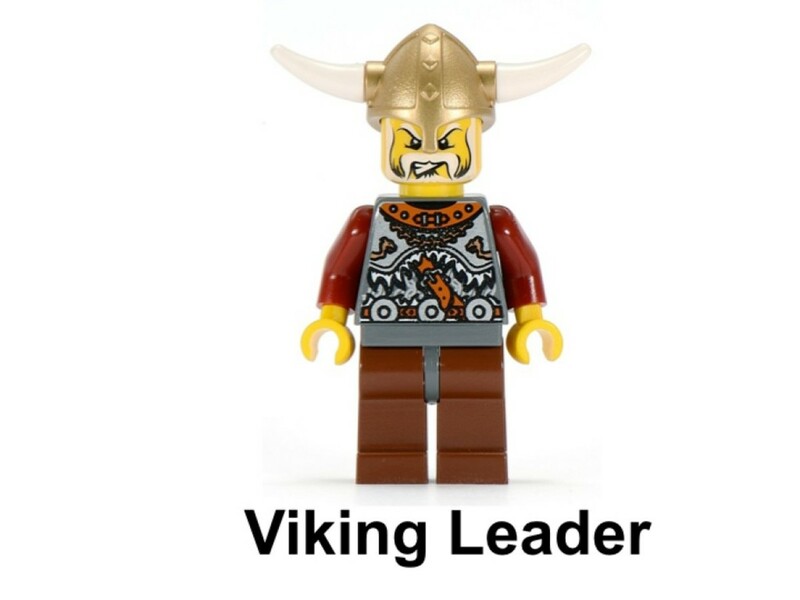 Their leader is identified by his golden helmet. The large artillery wagon can be pulled into the correct position thanks to its wheels. 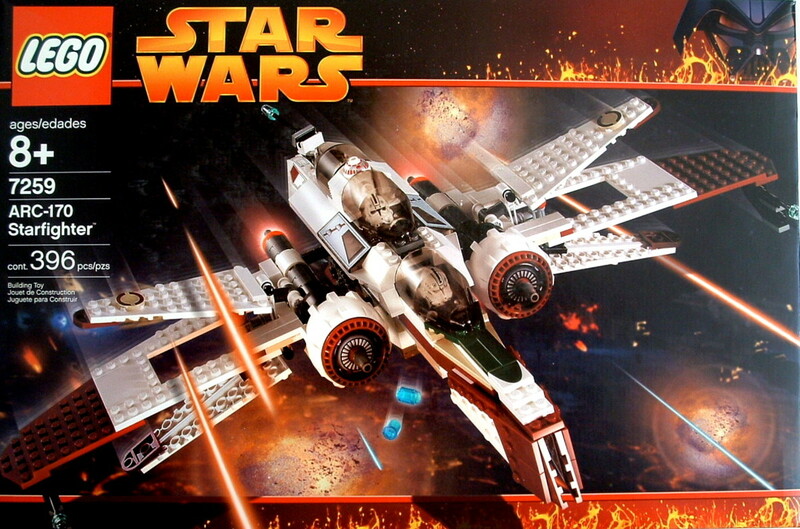 There is a turning rod in the back and it can fire six flick-fire missiles (flaming arrows) individually. 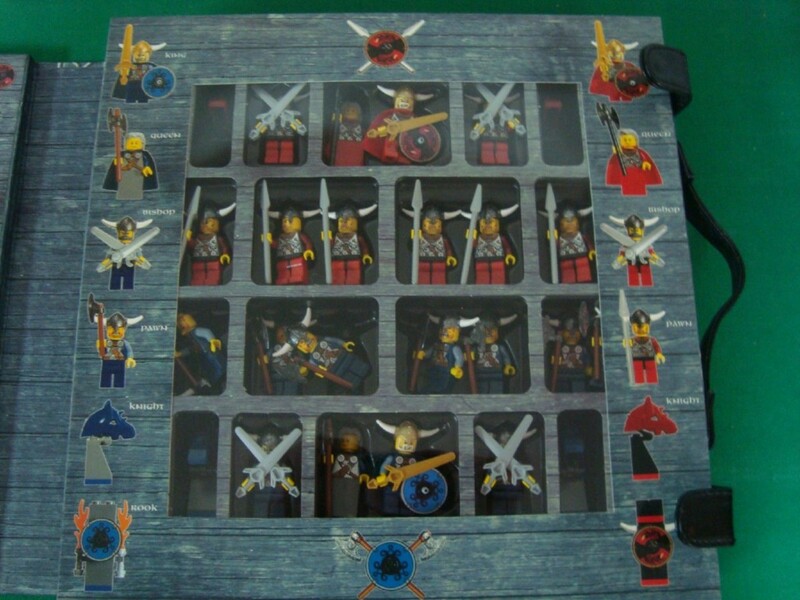 The minifigures are additionally armed with swords, spears and shields. According to different legends, the wyvern dragon could either breath fire or had a poisonous bite. It would also be described as having two legs or none. All versions had a scaled reptilian body, wings and a barbed tail. 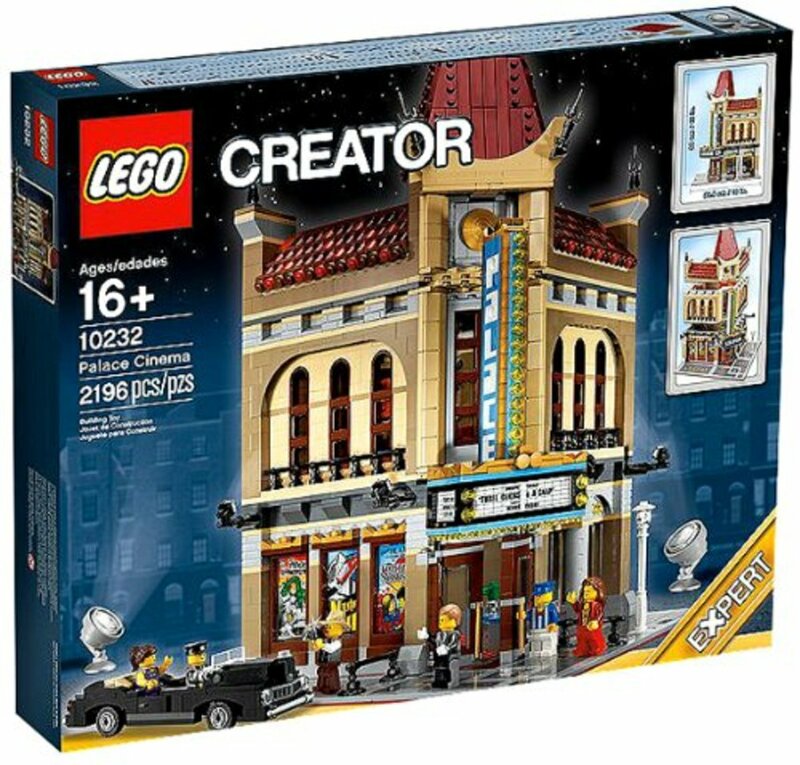 Today, the model itself does not appear special, but it is extremely desirable to LEGO collectors. This would not only feature the first wyvern, but it is the first dragon to not come from a single mold. 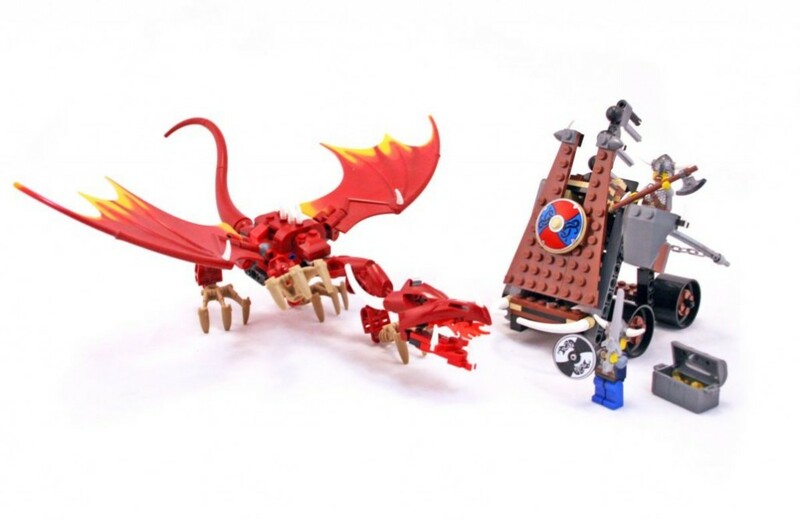 Builders assemble the dragon from several pieces, including TECHNIC parts. 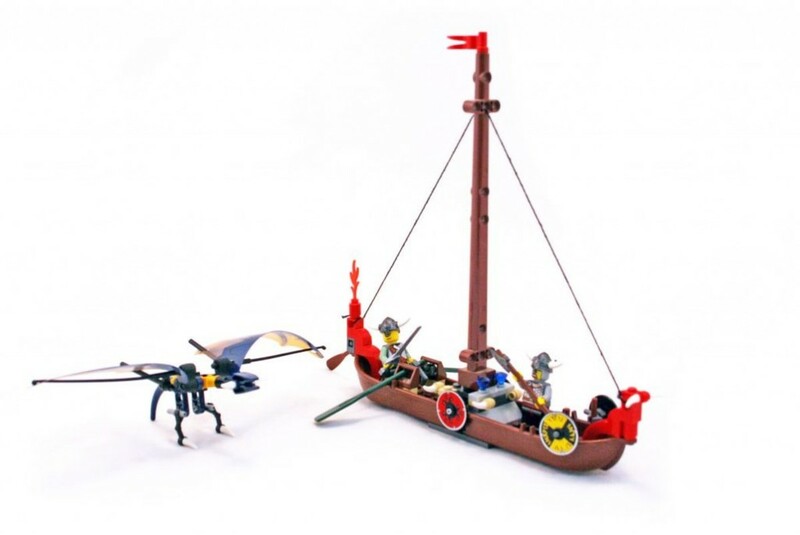 The Viking boat was also the smallest sailing ship in LEGO history. The Níðhöggr was an evil dragon in Norse mythology. This creature chewed at the roots of Yggdrasil, the world tree. It fed on the corpses in Náströnd, which was where the worst criminals went after they died. Today, it would be considered the lowest circle of Hell. 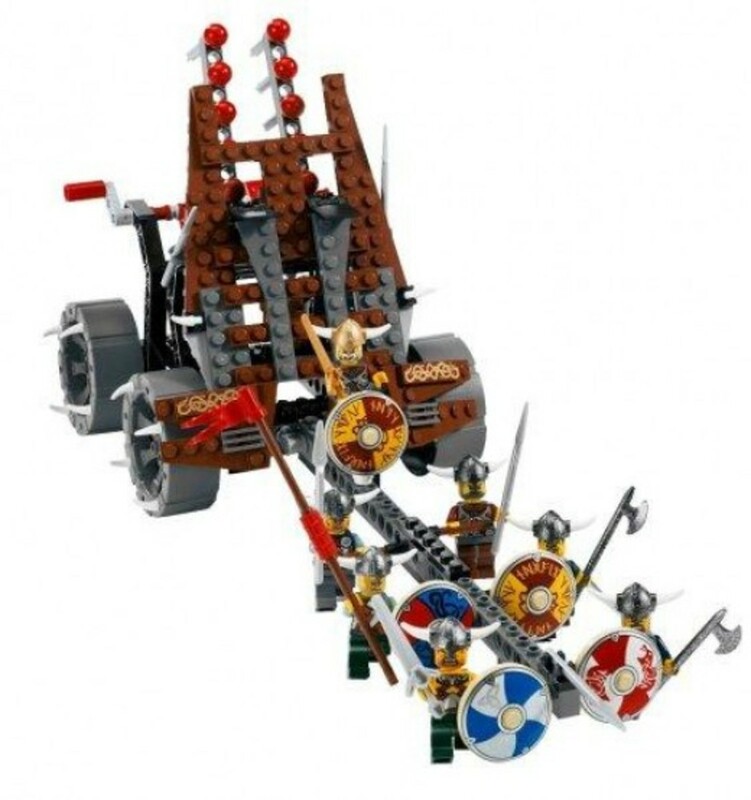 The catapult model is actually a large crossbow with a shielded front. To shoot the dragon out of the air, it is armed with three flick-fire arrows. Two horned spikes protect the front from being charged. 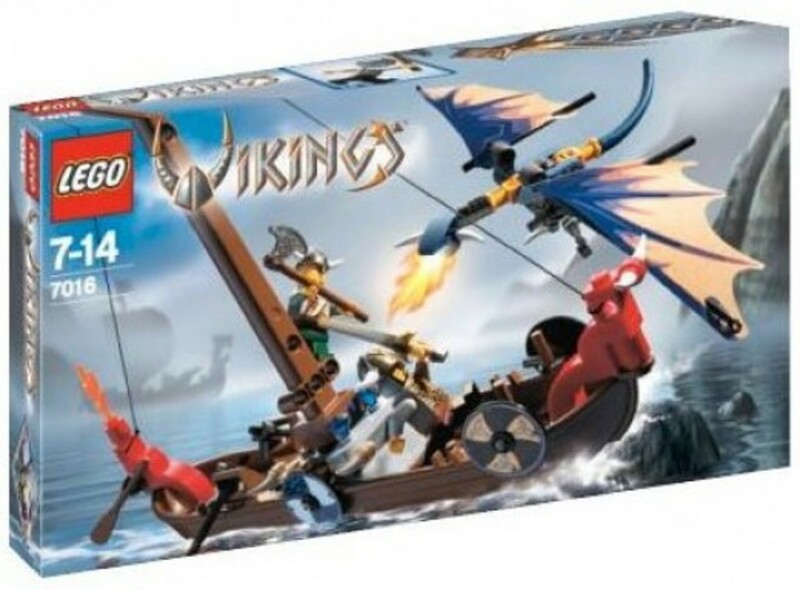 The set comes with a small treasure chest to store the Vikings plunder. Ofnir is briefly mentioned with a list of other serpent dragons in the Skáldskaparmál section of the Prose Edda Snorri. To take down the Ofnir wearing armour, the Vikings will need something more powerful than arrows. 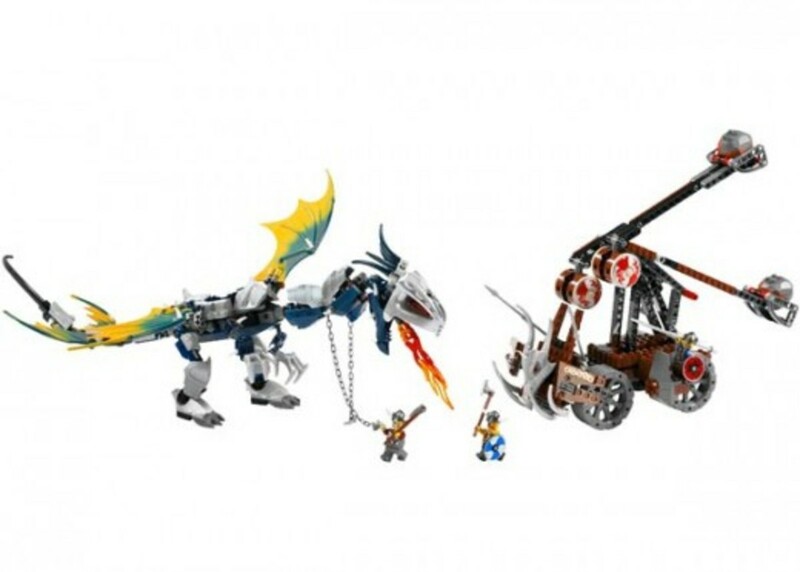 The double catapult uses TECHNIC pieces, allowing it to launch a BURP (big ugly rock piece) into the air and at the dragon. The catapult is well protected with spears and tusks sticking out the front. One unlucky Viking gets to try and hold the dragon in place with a chain. Fáfnir was one of three children to the dwarf king Hreidmar. He was the strongest and bravest of his brothers. Fáfnir murdered his father, in order to steal the gold of Andvari and the ring of Andavaranaut. With these cursed items in his possession, he went into the wilderness and turned into a dragon. He breathed poison onto the land around him to protect himself and the treasure. 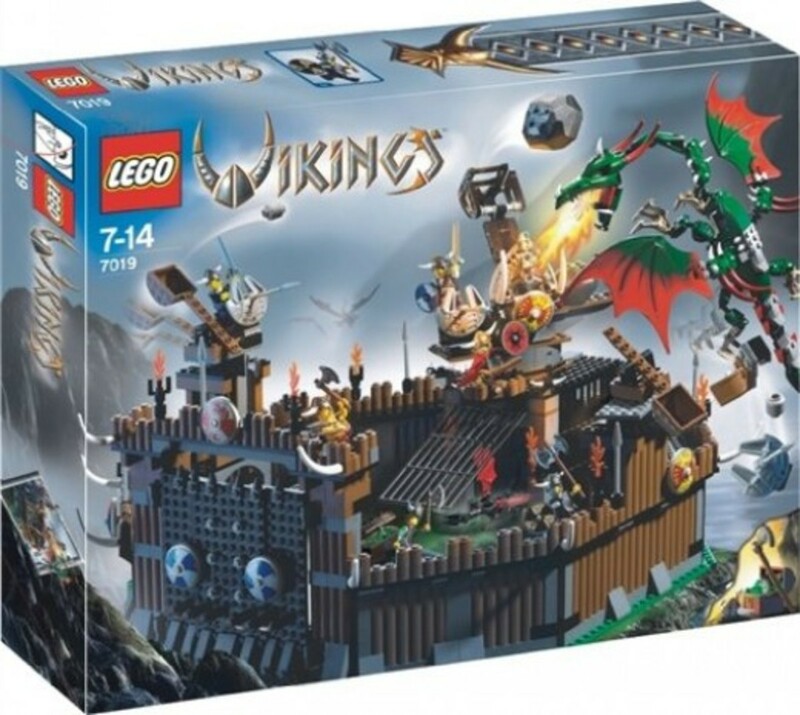 The wooden Viking fortress is the largest building set in the series. 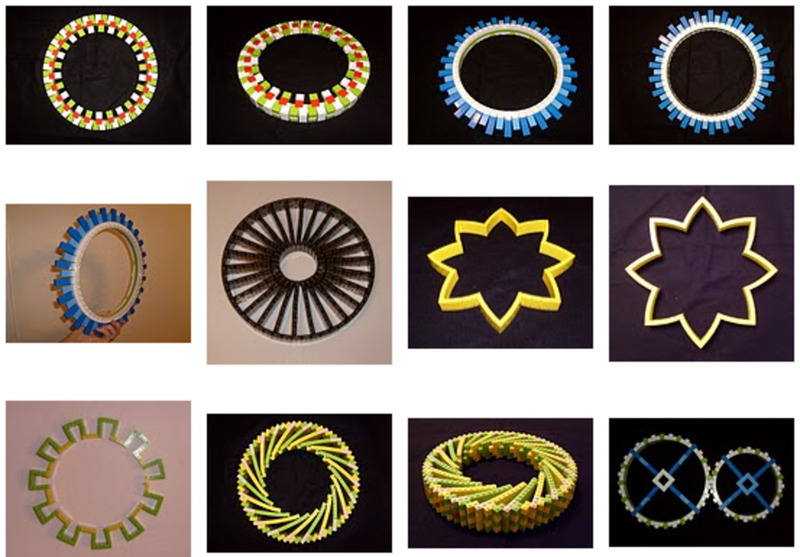 The walls encircled the grounds in an octagon and a large gate made of LEGO plates allowed access in and out of the complex. 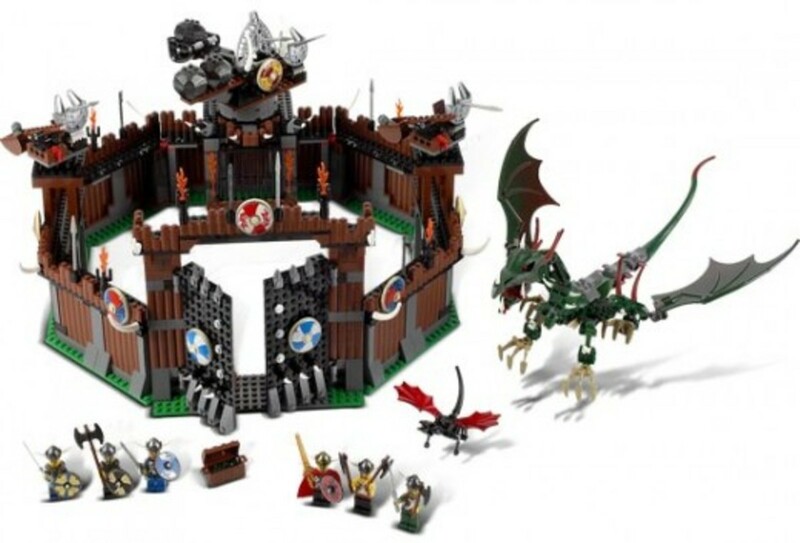 A large cage in the back could hold a small dragon prisoner. Above the cage, a big rotating catapult can launch BURPs into the air. Two smaller rotating catapults are located on the side palisades. The set comes with a small and large dragon. 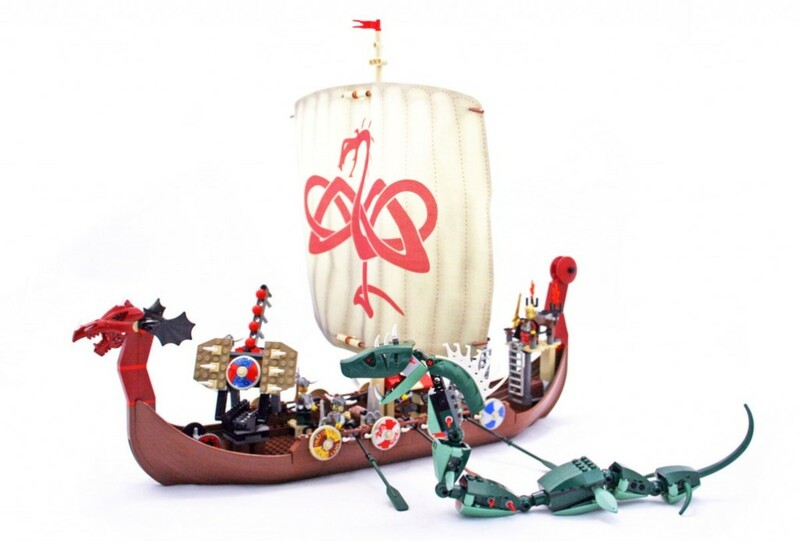 These serpents are mostly built with TECHNIC and BIONICLE pieces. Fenrir is the son of Loki and the father of the wolves Sköll and Hati Hróðvitnisson. Norse myth says that Fenrir would kill Odin during Ragnarök and then be slain by Odin's son Víðarr. 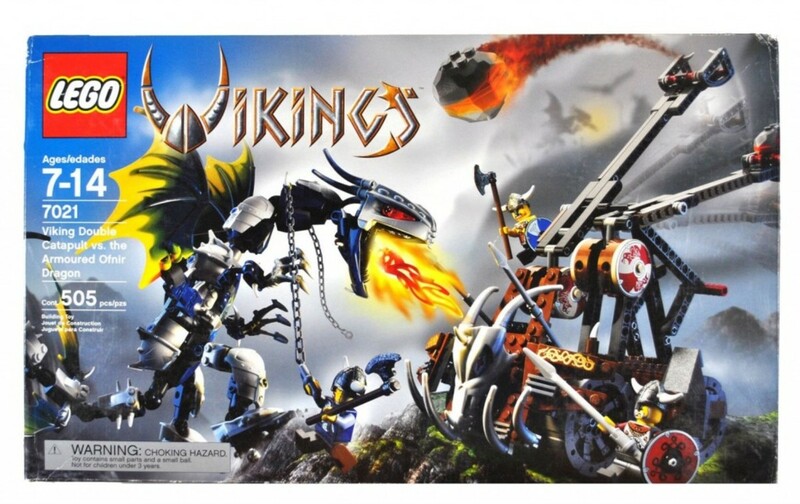 This is the smallest set in the Viking theme and most of its 76 pieces are used for assembling the large Fenris wolf. 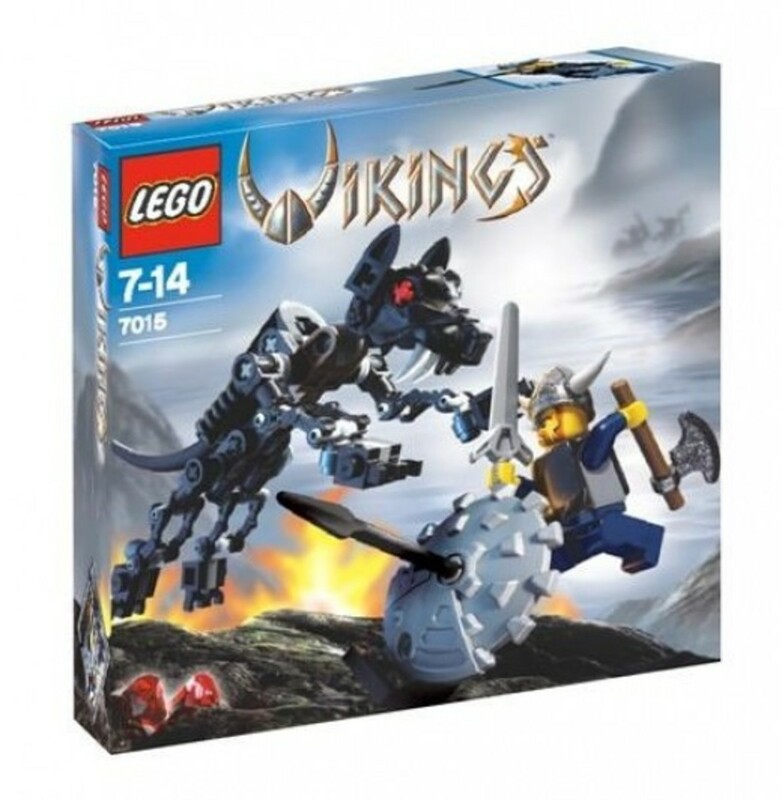 A lone Viking warrior armed with an axe, sword and shield is battling the monstrous wolf capable of killing gods. Good luck! 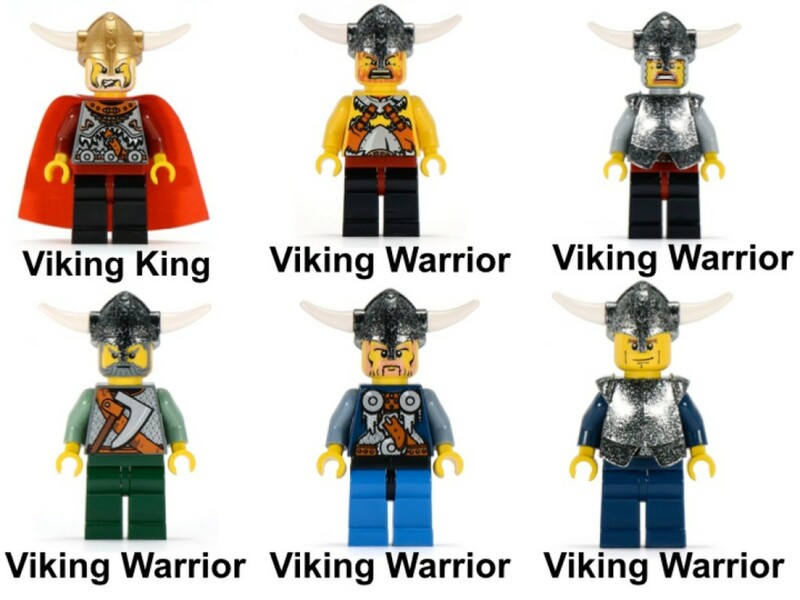 The Viking Chess Set was released under the System scale, meaning it used standard sized LEGO pieces built to Minifigure scale. 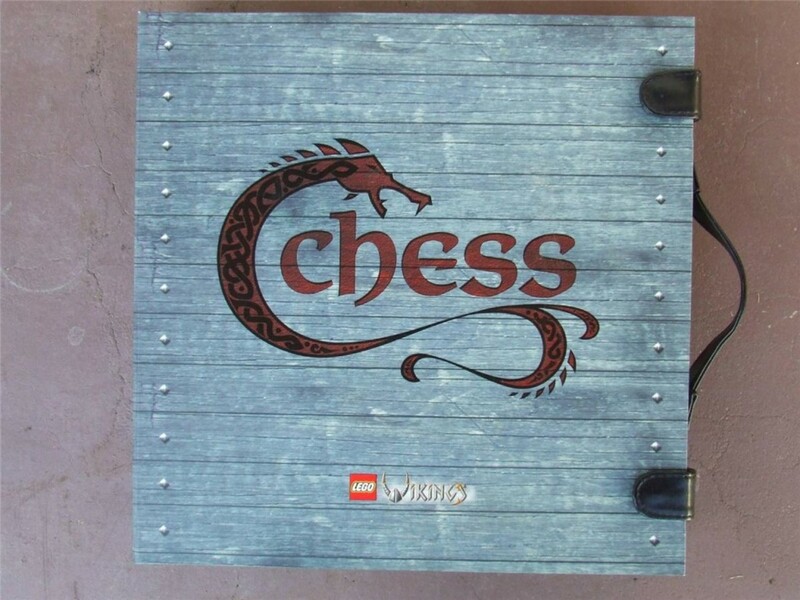 However, the only thing to assemble are the Minifigure chess pieces, because the board came glued together. 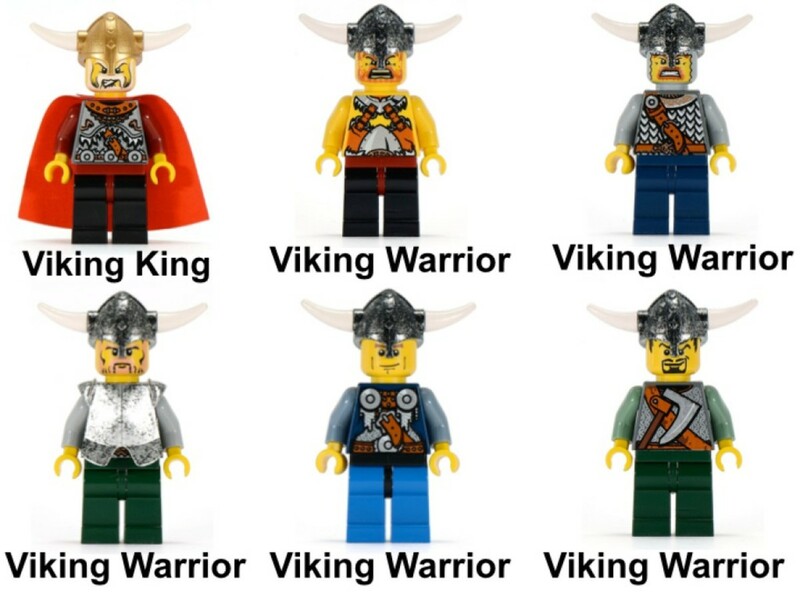 The pawns in the game are Viking warriors with an axe or spear. The rooks are towers glued together, with their teams flag on them. 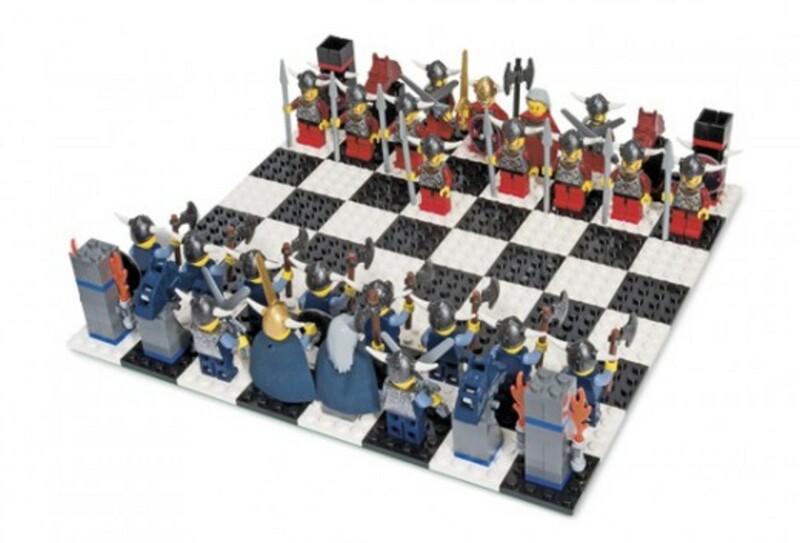 Rather than use a horse for the knight, LEGO placed a horse helmet on a stand. As a warrior culture, the bishops are armed with two swords. The Kings are decked out in golden helmets and swords. They also have capes and shields. The grey haired queens have capes and battle axes. Jörmungandr was also known as the Midgard Serpent or World Serpent. This sea serpent is the middle child of Loki and the giantess Angrboða. Odin threw Jörmungandr into the ocean encircling Midgard. It is said that Jörmungandr grew large enough to wrap around the Earth and grab its own tail. 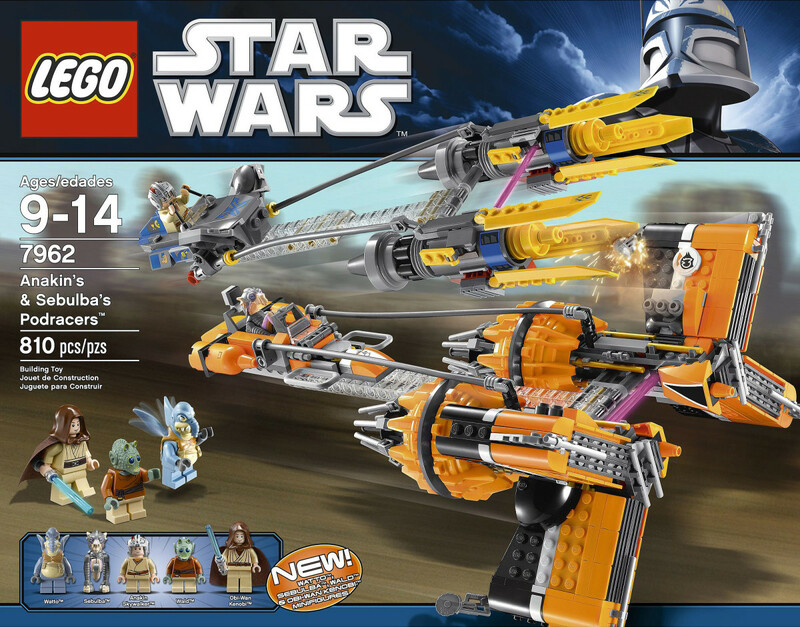 The construction of the two models in this set are basic in their designs. 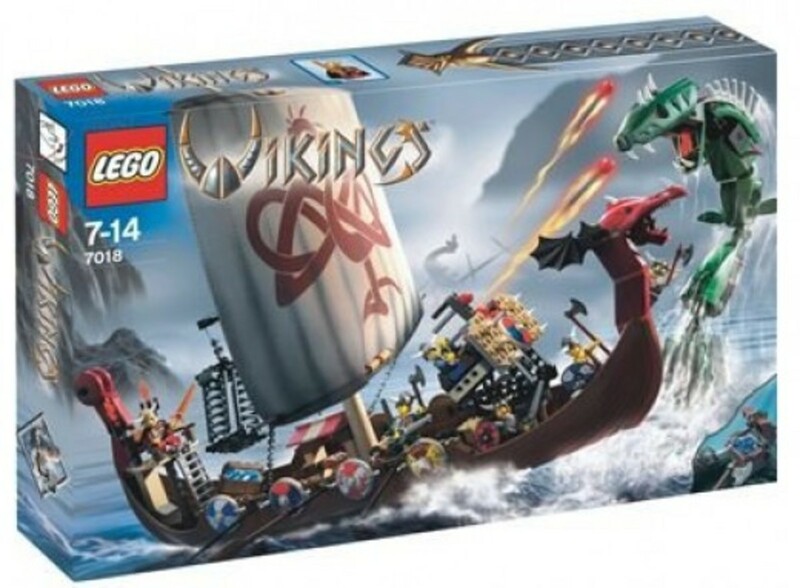 However, it would be the first galley ship and sea serpent released by LEGO. The ship had a turret capable of launching flick-fire arrows and a grill to cook the meat of whatever animal they killed.